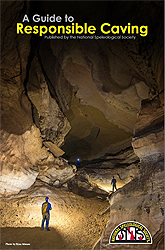 The NSS has developed the brochures below about the Society, caves, and caving. You may freely download and print the brochures, or complete the request form below to receive hard copies from the NSS Office. The brochures are in portable document form (PDF ) format. To view them, you will need Adobe Reader, which is available as a free download here. Learn about the Society's diverse programs, activities, and aspects of speleology in which members are involved. Understand the benefits of membership in the Society, and the value of membership to caves, caving, and speleology. This booklet discusses caves and the many elements of the sport of caving. Exploring caves is becoming increasingly popular in all areas of the world, and caving responsibly is more important now than ever. Discussions include safety, training, and learning to reduce the detrimental effect cavers can have on caves and cave owner relations. Lava tubes play important roles in our eco-system, our history, and our culture. Caves formed in lava are found where volcanoes have produced certain types of flowing lava--western United States, Canary Islands, Italy, Japan, Korea, Kenya, Australia, Pacific Ocean islands, and other volcanic hot spots. The islands of Hawaii harbor some of the world’s most spectacular lava tubes. Bats are among the most beneficial yet mis-understood mammals. They control insect populations, pollinate cacti and tropical fruit trees, and are important to medical and scientific advances. Sadly, bat colonies throughout the world are declining drastically as humans, intentionally and unintentionally, endanger bats and disturb their habitats. Bats are extraordinary in a number of ways. Information that can be passed out to cave owners, unaffiliated cavers, and others to spread awareness of the issue. Partnership brochure on WNS by the NSS, USGS, USFS, FWS & BCI. The NSS has this table top display available for short-term use by NSS members. The NSS will ship the unit to core elements of NSS, Inc. at no cost; IOs and members are responsible for shipping at their own expense and for the timely return of the display. The unit is free-standing and includes the two clip-on spotlights. Included are two Panel 4 "We Protect" options; one is specific to WNS and the other is more general. The cost of shipping both directions is the responsibility of the NSS IO or member borrowing the display, who are also responsible for any damage to the posters or display unit. For information, contact nss@caves.org. Then return here to order. downloadable PDFs for local printing. Note: A postage charge may apply to large orders. The NSS Office will contact you if a postage charge applies.